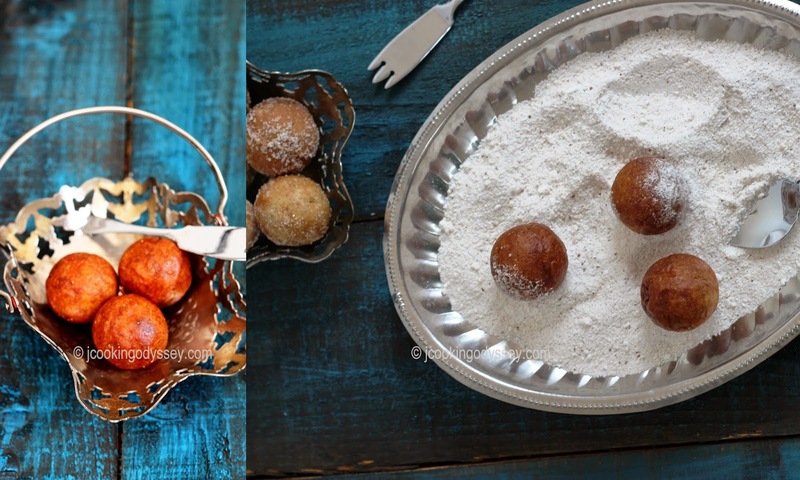 Jagruti's Cooking Odyssey: Traditional Gulgule - Baked Gulgule with Cinnamon - Wholemeal Jaggery Doughnuts with Cinnamon ! 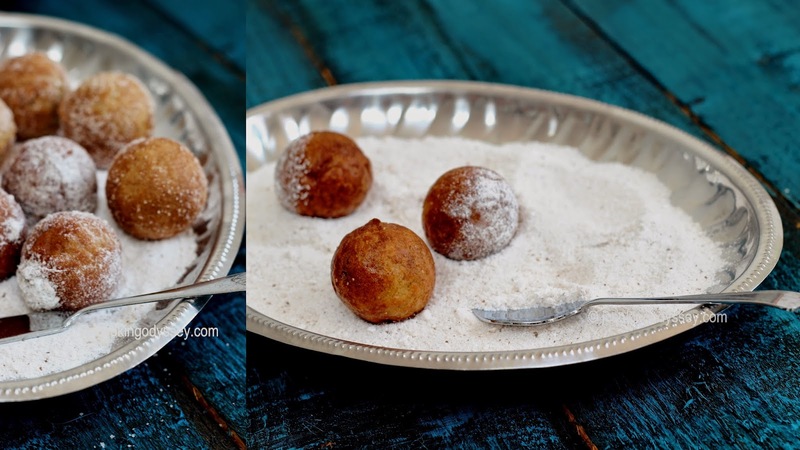 Traditional Gulgule - Baked Gulgule with Cinnamon - Wholemeal Jaggery Doughnuts with Cinnamon ! We as parents always try to give our kids their birthdays to remember without breaking a bank ! celebrated and still celebrating our kids birthday with so much enthusiasm and great zeal , inspired by their favourite books, TV programme , movie character we choose the birthday themes and their presents too. We Always had a different and quirky theme and tailor everything accordingly to their age, from the venue and decorations to the food and entertainment. During the children's birthday celebration, memories conjured up in my mind of how my own birthday used to be celebrated as a child and I haven't left any opportunities in telling the children about it. Me or my siblings never had a big birthday bashes or any themed parties with pretty frosted, decorated and delicious cakes to cut, yet we siblings and parents always eagerly waited for our special day and I have always treasured those memories with me which were woven around in that time ! Our birthday celebrations were just a family affair, not a big celebration and definitely no surprises whatsoever. Our day would start by waking up early and get blessings from the parents, with blessings sometimes dad would give us 5 or 10 rupees as a gift. We pretty much had Indian sweets and that too very simple instead of western cakes or pastries, it wasn't only us who were in this situation, around my time most of the families followed the same thoughts and patterns. Simply for lunch mum would prepare some delicious home cooked meal which includes some fried and sweet delicacies, then around evening time we would go and watch a movie or circus and on return we get ice cream or some snack from outside. My mum always cooked simple meals, she wouldn't hang around in the kitchen for so long, yet whatever she cooked always was so delicious and definitely worthy, and a superior meal which would bring all the reasons for celebrating the happy occasions, it could be any of these :- Gulab Jamun , Shrikhand and Puri , Lapsi ( broken wheat sweet )or potato Bhajiya or Onion pakora with Peas Pulao but somehow most of the time on my birthday mum prepared sweet and fluffy Gulgule, and those are my most fond birthday memories. 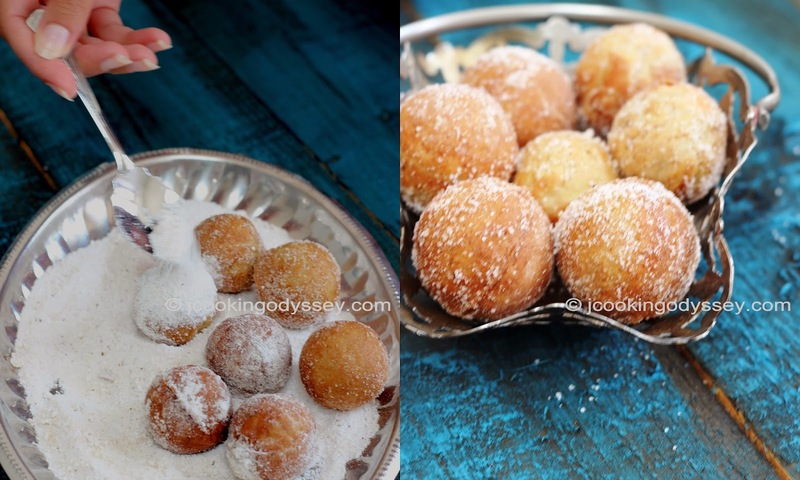 GulGule is a delicious lightly sweetened, golden fried eggless mini Indian doughnuts , made with few ingredients and so easy to prepare. Gulgule is widely prepared and eaten in North India and Rajasthan during most of the festive season. Gulgule weren't that popular in the Gujerat households around my time in India, however in our house Gulgule were making their appearances often as these were mum's favourite since her childhood as she spent her childhood in Rajasthan at her elder sister's. The day I prepared Gulgule, family became a huge fan of it, requests started coming more often, then I thought about making good use of my cake pop maker which was a surprise gift from hubby on my birthday couple of years back ! In a one big bowl add jiggery or sugar and water, make sure water just barely covers the jaggery. Once it has dissolve completely, strain the jaggery water. Batter should be thick but to a dropping constancy and leave it aside for 15-20 minutes. 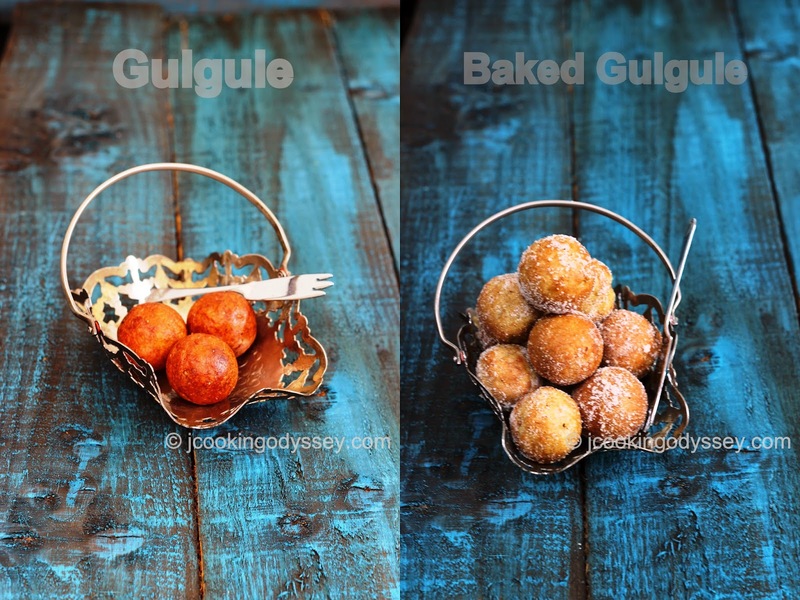 If you are deep frying the Gulgule ,beat the batter about 5-7 minutes, this process will make gulgule soft and fluffy without using baking powder. For deep frying heat oil in a karahi on a medium heat. With a wet hand, take a golf ball sized batter from the bowl. Shape it into a cylinder and drop it into the oil from the side of the karhai..just like pakoras. They will float to the surface. Cook and turning couple of times until the gugule turn golden brown and remove with a slotted spoon. Serve warm with puri and sabji or serve as a snack with tea or coffee. In a one big bowl add jaggery and water, make sure water just barely covers the jaggery. Add all the other ingredients with baking powder and combine well. Batter should be thick but to a dropping constancy. I baked Gulgule using cake pop maker. Mix caster sugar and cinnamon powder. As soon as gulgule ready, coat them in a cinnamon sugar, if sugar doesn't stick, then apply little melted butter or honey on gulgule then coat in a sugar. Enjoy warm with tea or coffee. I have never had gulgule so will definitely be trying out your recipe. Thanks for sharing the baked version I am going to try this. I have never had gulgule, but your preparation looks so tempting that I have bookmarked this recipe. YUM!!! These look so delish!